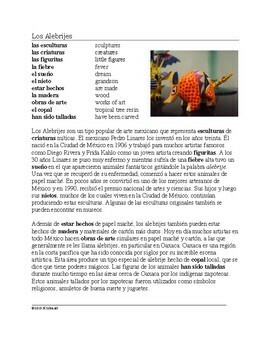 ~A reading that describes the history of Alebrijes, a Mexican Folk Art Tradition begun in the 1930s by Pedro Linares. It discusses the various materials used create these fantastical animals as well as the importance of the Oaxaca region in Mexican Art. Also included is a paragraph on the annual parade of Alebrijes in Mexico City as well as a similar type of art created by the local indigenous Zapotec people made from the copal tree. Also includes a full glossary of new vocabulary. 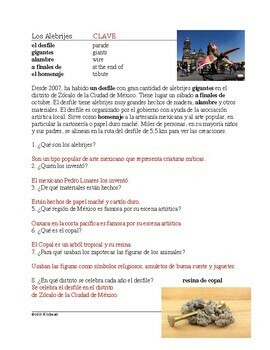 ~A worksheet with 8 reading comprehension questions.